The brilliant electrochemical expert from University of Washington, Thomas Ross, certainly was not the first and only man, who can be credited for creating a thinking machine. Actually Ross got his original inspiration by the works of Clark Leonard Hull (1884-1952), an influential American psychologist, who studied logic and engineering and sought to explain learning and motivation by scientific laws of behavior, and his followers Nicolas Rashevsky (1899-1972), Robert G. Krueger and H. D. Baernstein. In the same 1929 Baernstein created a device, which was intended to simulate several features of conditioned reflex training. It was demonstrated at a Psychological Conference in Urbana, Illinois, attracted wide interest, and the press referred it as mysterious mechanical brain. Thus in the beginning of 1930s Thomas Ross (1909-2010) of McClips, Washington, a junior student at the University of Washington, started his work on automata, which can be considered as the first practical attempt to make a machine that would imitate a living creature in performance. These machines seems to have been suggested by the familiar test of animal intelligence in finding the way out of a maze. By trial and error his maze-solver could learn to find its way to a correct goal on a system of toy-train tracks. In 1933 Ross built a mechanical arm powered by an electrical engine that explored five parallel paths in a kind of vertical maze, searching one after the other from entrance to exit. The goal was to point out a solution to the maze. Rather complicated electrical circuits constituting the memory cells of this primitive robot were responsible for its performance. 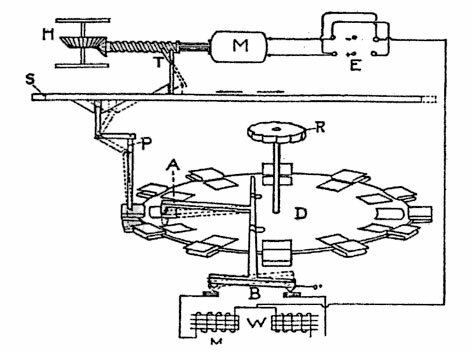 This device, as well other ideas of Ross, were described in the article The Machines that Think for Scientific American from April, 1933 (see the article of Thomas Ross in the April, 1933 issue of Scientific American). 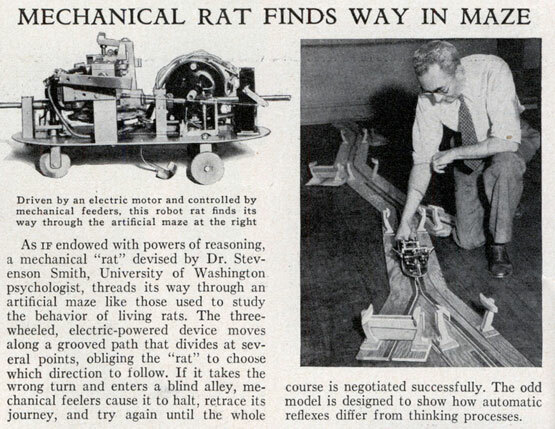 In Seattle last week Dr. Stevenson Smith, University of Washington psychology professor, delighted colleagues and students by showing them a complicated "mechanical rat" which he and a helper had worked five years to perfect. Living rats, especially white ones, are favorites with animal psychologists who teach them to traverse complex mazes bristling with blind alleys, studying the effect on maze-learning of food, light, electric shock, drugs, blasts of air. The Stevenson rat is impervious to all such lures and hindrances. Resembling a three-wheeled roller skate loaded with small motors, electromagnets and switches, the robot is set on a track containing twelve forks at each of which a wrong turn leads to a dead-end. The robot is first set to take the turn to the right at every fork. When this proves to be wrong and results in a bump against the dead-end, the "rat" goes into reverse, backs up past the fork, goes forward again, taking the correct left turn. This resets the controls in such a way as to enable the "rat" on the second try to negotiate the maze from start to finish without a single error. "This machine," said its inventor, "remembers what it has learned far better than any man or animal. No living organism can be depended upon to make no errors of this type after one trial." This machine runs through a twelve-unit, multiple-Y maze in which the twelve sections are so arranged that each has one blocked branch and one branch that opens into the stem of the next section. placed at the beginning of this maze and set in motion by connection to an electrical supply, the machine will begin rolling through the maze on its three wheels. Being constructed with a tendency to turn to the right, it will, on coming to the forking of the first Y-section, run down the right-hand passage. If this passage is blocked (by a vertical wall at the end) the machine will back out of that passage and turn to the left upon again starting forward. Since the maze is so arranged that one passage in each section is open, the left-hand passage will now lead directly to the beginning of the next section of the maze, at which point the machine will receive a 'cue' that it has entered a new section as it brushes its two metal 'feelers' against a pair of blocks set on the sides of the passage. (…) On being again started through the maze, the machine will go from beginning to end without entering any of the blind passages which it entered on the first trip through, and every time after will repeat the performance without 'error'. Before the robot entered the maze, all 12 tabs on the disk were raised, but the mechanism was designed so that when the robot took the dead-end path to the right, one of the tabs went down and a circuit was activated that prevented the car from turning right again at that particular split in the path. The robots successful and unsuccessful "trials", its turn to the right and then to the left, were registered on the disk in the form of a pattern of 12 depressed and raised tabs. As the robot passed all twelve "Y"-sections of the maze, the disk went through a complete rotation and arrived back at its starting position, but now the 12 tabs were in a pattern, that prevented the robot from turning right. In other words, the correct path was imprinted in the robot's memory disk, and afterwards the robot never made errors when going through the maze.